The restaurant opened in November 2007. The Manager, a successful businessman, started his restaurant as a business club where Chinese businesses, CEO’s, and foreign diplomats could come together to enjoy the relaxing atmosphere of the club and its fabulous teas and food. Membership starts at 10,000 RMB, member’s age’s start from 30, but you don’t need to be a member to come and enjoy their very fancy and excellent Chinese fusion cuisine. The private rooms are clean and neat, and the owner made the furniture himself. You might be pleased to find a fork and knife on your table. It can always be useful for some of us! The restaurant is on the second floor, while downstairs you can enjoy the bar and try some unique teas while enjoying many antique tea pots and other objects displayed. Don’t forget to take a closer look to the golden ceiling and its details! Food was obviously a very high level: we started with a fruit salad (Chinese pickles); sliced beef, ham, sea ear and cucumber as a cold appetizer. Note that the starter is different every time. For the hot dishes we first started with a soup with all kinds of wild bamboo and mushrooms; then shark fin in Chinese Casserole with rice; a delicious portion of codfish; and some nice fresh vegetables (asparagus, lily bulb, peppers). As dessert we had a tart and kidney bean paste roll. Dessert is again different every time. 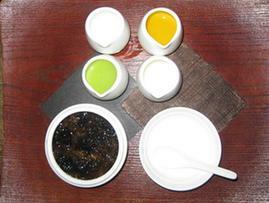 We finished with a classic but authentic bird’s nest soup followed by home-made yogurt with 2 sauces. Isn’t you mouthwatering right now? As well as their unique food culture (Chinese fusion), you will certainly enjoy their large collection of antique tea pots, hundreds of different teas, their paintings and Chinese original artifacts. If you want to try something other than a classic restaurant and food, this is the place to go. You’ll discover authentic Chinese food, ingredients and fusion cuisine.